MH20i Manual CMM Probe Head - CMM Inc. 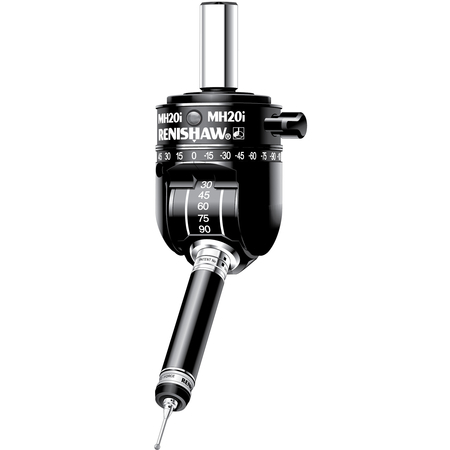 The MH20i Manual probe head offers modular flexibility. It is the perfect solution for any user who is looking to enhance the performance of theirmanualco-ordinate measuring machine. Specifically, this probe head has a flexible platform with an integral TP20 probe body. It combines the TP20 kinematic stylus module mount with two axis indexing. The MH20i platform enables flexible stylus changing and repeatable probe re-orientation. Furthermore, the user can combine probe and stylus changing, for optimum CMM functionality. A manually adjusted lever locks the head into one of its 168 repeatable positions.The A-axis rotates through ±180° in the X-Y plane, the B-axis rotates through 90° in the Z plane and a lever locks the head in one of up to 168 repeatable positions, set at 15° increments. The MH20i Manual Probe Head is capable of carrying the full range of TP20 modules. These modules can be changed without re-qualification, providing qualification has taken place in each position with each stylus/module combination.